National Instruments has announced the release of the NI USB-5132/5133 digitizers and the NI USB-4065 6½-digit Digital Multimeter (DMM). These small, lightweight instruments feature bus-powered and plug-and-play operation, which makes them ideal for portable, benchtop and OEM applications. 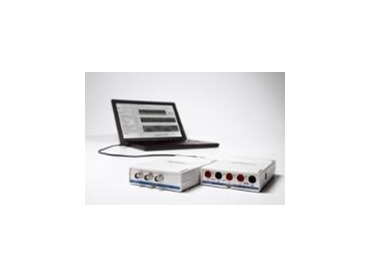 They are also shipped with NI LabVIEW SignalExpress LE interactive measurement workbench software for quickly acquiring, analyzing and presenting data with no programming required. The USB-5132/5133 50 MS/s and 100 MS/s digitizers offer two simultaneously sampled channels with 8-bit resolution. These USB digitizers feature 10 input ranges from 40mV to 40V and programmable DC offset and come standard with 4 MB/ch of onboard memory for measurements requiring extended data captures. The USB-4065 DMM offers 6½ digits of resolution at up to 10 readings per second and up to 3,000 readings per second at lower resolutions. With ±300V of isolation, current measurements up to 3A and 2- or 4-wire resistance measurements, the USB-4065 offers a complete multimeter solution for portable 6½-digit measurement needs. Each of these instruments includes its own soft front panel, which provides an interactive, familiar interface to get up and running quickly. For data-logging applications, engineers can easily combine the USB-5132/5133 digitizers and the USB-4065 6 ½-digit DMM with LabVIEW SignalExpress measurement software. Together, this intuitive software and the bus-powered architecture of these new instruments are extending the ease of use and performance of portable measurements. NI modular instruments are the building blocks for economical and versatile automated test systems. With modular instruments, engineers specify the essential functionality they require, choosing from a wide variety of measurement, signal generation, RF, power and switch modules, then configure those instruments in software for their specific measurement tasks. Because these instruments are modular and software-defined, they are quickly interchanged and easily repurposed to meet the challenge of evolving test needs. NI modular instruments are available on a variety of platforms including PXI, PXI Express, PCI, PCI Express and PCMCIA and provide the advantage of high-speed test execution by harnessing the power of industry-standard PC and advanced timing and synchronization technologies.